Madame Mimose is an extraordinary woman who opened up her heart and hotel to people during Haiti’s Hurricane Matthew in 2011. Mimose runs a hotel in Torbeck, Haiti, which is just east of the worst hit areas by Matthew’s 145 mph winds. That is a wind speed you can’t stand up in, where roofs fly off and masonry collapses, where vehicles tip over. 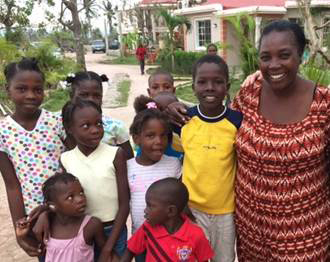 In the days following the hurricane, Mimose ended up housing over 300 people in her hotel. Then in the weeks and months following, she continued to help her community with food donations. This was made possible by her own local not-for-profit organization Groupe d’Action pour l’Habilitation Economique et Sociale de la Famille Haïtienne (GRAFHES). This local social enterprise trains and helps Haitian communities, improves living conditions in agricultural areas, and has been providing 13,000 students with hot meals throughout the year. Madame Mimose embodies the ‘Haitians helping Haitians’ philosophy, known locally as ‘konbit’, and we are grateful to have met her. ShelterBox was able to provide ShelterKits and supplies for many of the families who had been staying at the hotel whose homes were destroyed.